Today, Microsoft announced a tailored message and alert social network called Vine. It is very local in scope and in restricted beta. Seattle is one of the first test areas (I intend to test the service but have not been accepted as of yet). Vine is intended to be a dashboard that people can use to keep tabs of their family, friends, activities and major events in their community. Could be fascinating if it works. Brier Dudley of the Seattle Times has a long blog piece on Vine and its initial use for emergency services. It some regards it is similar to the impromptu mashups that arose during the Hurricane Katrina disaster. One of the comments, associated with the story pointed me to bliin, a similar Dutch effort. They have an interesting application that geotags photographs as they are taken for upload to a trip report (or vacation record). This got me thinking to another post I read on what folks actually photograph. 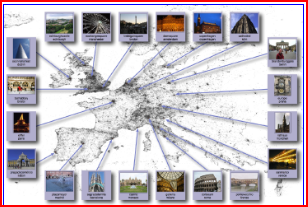 In one of the largest samples used for crowd sourcing, a group of researchers from Cornell University have analyzed over 35 million geotagged photos on Flickr and have built maps based on those photos. These maps don’t show roads and buildings per se but show hot spots of activity – there are over 130,000 tagged photos of the Taj Mahal on Flickr for example. So on their Asia map, Kolkata and Agra (home of the Taj Mahal) appear the same size yet Kolkata has six times the population. This map of ‘photo attractiveness’ is a fascinating concept as it shifts how you view a map from being static data (roads and rivers) to also having a focus on information and opinion. It will be interesting to see how successful Microsoft Vine, Google latitude, bliin and others are in utilizing this concept. This entry was posted in Consumer Electronics, culture and tagged flickr, geotagging, mashups, social networks by geoff. Bookmark the permalink.